Many people take an interest in printing their digital photographs from their digital camera. But most graphics programs can only print one photograph per page. And most desktop publishing programs are very pricey. Printing one photograph per page can be costly especially when using expensive photo paper. Buying separate graphics and desktop publishing programs can quickly add up to a large sum of money. 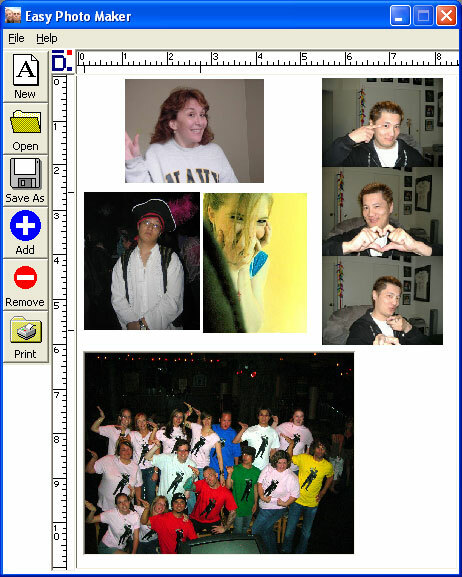 Easy Photo Maker enables you to save money on photo paper by laying out several digital images on a single sheet of paper. You can save each layout and retrieve them at a later time for modification or reprinting. You can print images of various sizes of the same or different photos on a single sheet of paper by simply dragging and dropping images. Easy Photo Maker prints to most types of paper on inkjet, laser and photo printers. Easy Photo Maker is versatile. It supports all of the popular digital camera graphic formats. A simple and intuitive user interface shows you the page layout as you design your page. You can create collages of your family which other photo editing programs cannot do. Design your own professional icons quickly and easily. Qweas is providing links to Easy Photo Maker 1.07 as a courtesy, and makes no representations regarding Easy Photo Maker or any other applications or any information related thereto. Any questions, complaints or claims regarding this application Easy Photo Maker 1.07 must be directed to the appropriate software vendor. You may click the publisher link of Easy Photo Maker on the top of this page to get more details about the vendor.